Excess fat on your upper back can cause bulges in your clothing, especially if you are a female. Though it’s impossible to spot reduce fat, you can employ a diet and fitness program that will help you to burn fat off your entire body, which, combined with exercises that tone and strengthen your back, can give you sleek smooth lines no matter how tight your top is. Reduce the amount of calories that you eat each day in order to reduce the amount of fat throughout your entire body. One pound of body weight is equivalent to 3,500 calories; reducing your caloric intake by 500 calories each day can help you lose 1 lb. per week. Incorporate more foods that assist with weight loss into your meals. Eat to fuel your body with a healthy dose of fiber, vitamins and minerals, such as vegetables like leafy greens, fruit like apples and pears, lean protein like skinless grilled chicken, whole grains such as brown rice and whole-wheat bread and healthy poly- and monounsaturated fats, such as olive oil and avocados. Eliminate foods that are digested quickly and can cause a greater amount of weight gain, such as those that contain added sugars, white flour and saturated fat. Examples include cupcakes, potato chips, ice cream and white bread. Burn additional calories with cardiovascular exercise. Use cardio machines that also help tone your back muscles, such as the elliptical trainer with moving arms, which can burn approximately 292 calories in 30 minutes, according to "Fitness" magazine. 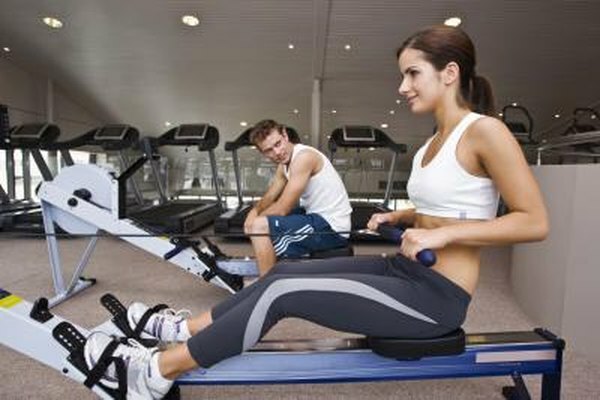 Work out on the rowing machine to also strengthen your back and burn 344 calories in a half-hour. Complete three sets of 10 to 15 pushups three times per week to tone, sculpt and strengthen your upper back. Place your body in the top of a pushup position with your hands flat on the floor under your shoulders and toes tucked under so that your body is in one straight line. Bend your arms to lower your body toward the floor. Stop when your upper arms are parallel to the floor and push back up to starting position. Perform three sets of 10 to 12 lat pulldowns three times a week as well. Sit on the seat of the lat pulldown machine and adjust the kneepads to be right above your knees and thighs. Take hold of the lat pulldown bar with a grip that is wider than your shoulders. Engage your abdominals and keep your back straight as you pull the bar down to your chest. Release the bar back up to starting position in a controlled motion. Consult a doctor before starting a new diet or exercise regimen, especially if you have an injury or medical condition or have been inactive.